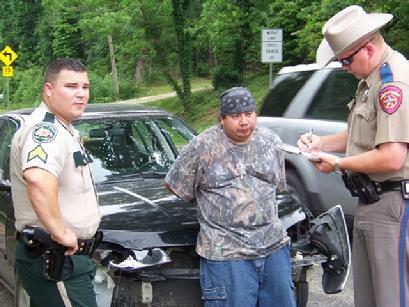 Intoxicated Driver Causes 3 Vehicle Accident in Leggett, LEGGETT, May 10, 2008 - According to DPS Trooper David Morris, an intoxicated driver caused a three vehicle accident on Highway 59 and 942 early Saturday afternoon. At approximately 12:30 a Pontiac Sunfire driven by Catalina Escoveto, 40, of Lufkin was north bound on 59 passing through Leggett (with her husband, Valta 43, and daughter Brianna, 3) when a late model Nissan Sentra driven by Abel Thompson, 34, of Livingston was south bound and attempted to turn left onto 942. The turn put Thompson directly in the path of Escoveto and a collision occurred. The impact spun Escoveto's vehicle around the opposite direction that she was traveling and she slammed into a late model Nissan Titan driven by David Hamilton, 43, of Houston, who was waiting at a Stop sign on 942. DPS Trooper David Morris arrived on the scene and was assisted by Polk County Sheriff's Deputies Mike Nettles and Jason Paske. Additionally, Texas Parks Game Warden Suzanne Cotton arrived to lend assistance. One lane of traffic on the north bound side of 59 was blocked while the accident was being investigated and cleared. An Americare Ambulance arrived on the scene but all parties refused any treatment. Thompson was placed under arrest for suspicion of DWI and taken to Polk County Jail where he was booked in. In addition, Thompson had a warrant out for his arrest for a firearm violation and disorderly conduct. Thompson was issued a citation for DWI and no insurance while Escoveto received a citation for no insurance. A rollback wrecker from Ken's Towing arrived and hauled away the Pontiac Sunfire and the Nissan Titan while a wrecker from Polock's wrecker service hauled away Thompson's Nissan Sentra. The accident was cleared out before 2 pm.